You can now pre-order the Samsung Gear 360 in the US and UK from retailer MobileFun. 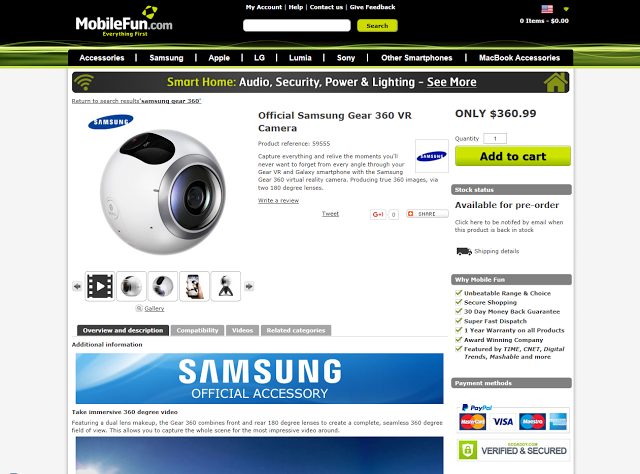 The US site, MobileFun.com, lists the price as $360.99. The UK site, MobileFun.co.uk, lists the price as £299.99. Sammobile.com says MobileFun UK is expecting the stock in mid-June. Thanks to @MikeCane (Atomic Supermen blog) for letting me know about this!